There is something very natural about Samantha Tonge’s writing. Her stories flow easily and there are perfect relationships and heart-warming characters to wrap yourself up in which helps you immerse yourself immediately in the story. 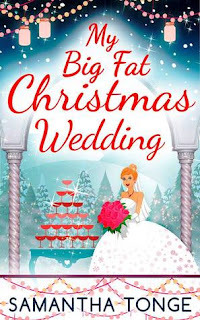 My Big Fat Christmas Wedding has Pippa and Nico getting married during the Christmas season in a small town in Greece. The novel is contemporary and sets us in the country during economic uncertainty. The plot also includes modern events which will no doubt leave you thinking about your own position in life. I liked that the author didn’t avoid these topics altogether but left them placed just so for you to contemplate- it was well done. Julie has pre-wedding nerves, and not just the typical ones that have her questioning if she’s ready to commit to one man for the rest of her life, her nerves revolve mostly around if she’s ready to commit to the mental scope available to her from the small village life. I could understand that she was worried that the idyllic setting would wear off and become less than she needed intellectually. Nico, of course, is charming and the picture of what one would expect. I’m glad he was also tough enough to make sure she knew his position and didn’t back down- we didn’t need a wishy-washy hero! But most charming to me was the incorporation of the villagers lives and how everyone was involved (in a good way) in each other’s lives. The simplicity in their helping of each other was encouraging on a larger scale. Though the story was simple, the writing clearly expressed the characters turmoil and the hope for the village’s future.